Background checks are not only conducted by personnel in the industry of security and safety, but also by companies who want to ensure that their employees are being honest to their employment claims. This can be done by using employment reference forms during the process of applicant selection and employment verification. What Is an Employment Reference Form? An employment reference form is a document used for recording the references of an applicant, either from his previous jobs or from the organizations that he had gotten involved in. The details in the applicant’s references will allow an employer to acknowledge the applicant’s background as well as identify the applicant’s skills and abilities. In addition, employment reference forms can also be used by a company’s current employee who wants to avail the job promotion or job transfer from one job position to another. This means that the form is suitable and relevant to be used by a company’s hiring personnel for internal and external job offers. Step 1: Incorporate the company’s banner. The company’s banner can be the header of the form which will state the name of the company along with the company’s contact information and address. In addition, the title of the form and its document reference identification number can also be placed below the banner. Step 2: Make a section for the applicant’s details. 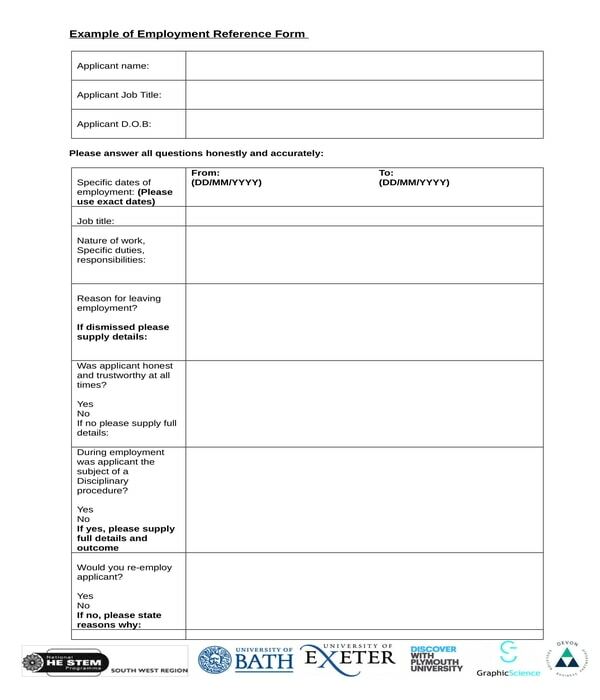 The details of the applicant which will be indicated in this section of the form should include the applicant’s name, reference number, and date of birth. The applicant’s phone number can also be collected in this section with his electronic mailing address. Step 3: Add a table for the reference information. The table can contain two columns and a number of rows for the details of the applicant’s reference person. The rows will be allotted for the name of the reference person, his contact numbers, the company that he is representing in, and his job position in the company. Step 4: Enlist the questions to be answered by the reference person. The questions should focus on the background of the applicant such as the applicant’s dates of employment in the reference person’s company, the applicant’s former job title, the applicant’s nature of work, and the reason why the applicant has left the company. Moreover, questions which will determine and record the applicant’s attitude, trustworthiness, work initiative, and general conduct are also relevant to be included in this section of the form. Step 5: Include a signature block. The signature block is essential to be completed by the reference person as well as the interviewer. 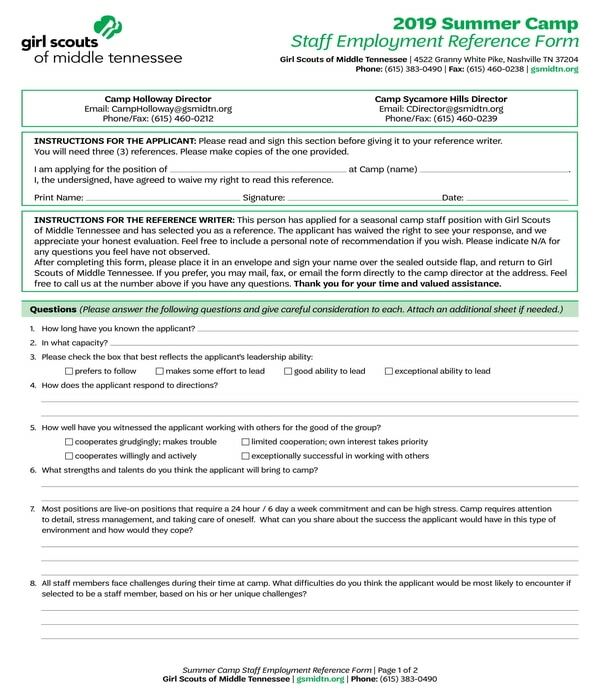 This section of the form will have the signature and the date when the reference person has filled out the form, or when the reference person was interviewed. In addition, an area for the comments of the reference person can also be indicated which is for other details and observations about the applicant’s background. After each section is made, the form must then be saved into a format which can be reused and be updated over time. Some of the known formats include “.DOC”, “.PDF”, and “.XLS”. Each of these formats has different functions and features that companies can use for varying media forms and intents. For instance, a “.PDF” format is preferable for printing and sending the employment reference form via email, a “.DOC” is suitable to be used within the company to ensure that the layout will not be distorted, while “.XLS” formats are suitable for companies who prefer to use rows and columns for their reference form rather than a plain white sheet of document. 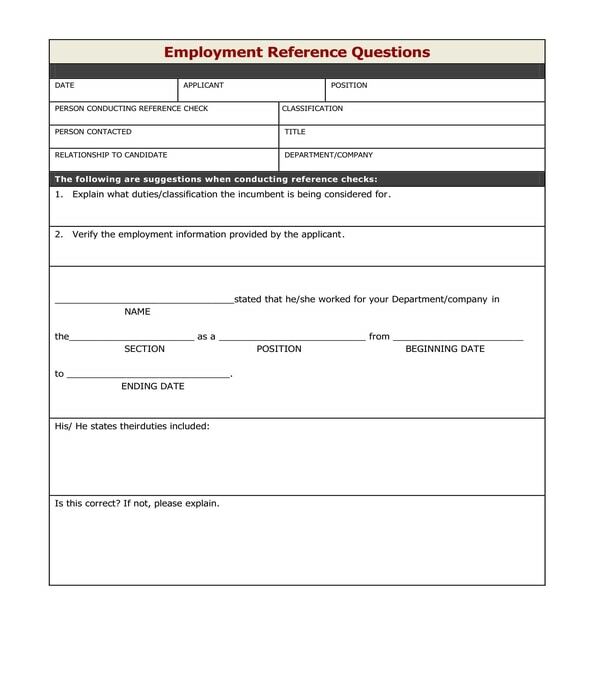 Employment Reference Questionnaire Form – This form contains two sections which are all intended to be filled out by the hiring personnel of a company or the interviewer of the applicant’s reference person. In the first section of the form, the date when the interview was conducted, the name of the applicant, and the general information of the interviewer will be disclosed. The second section, on the other hand, will be for the explanation of the applicant’s duties and responsibilities along with his job details. Additionally, the applicant’s quality of work, strengths, and shortcomings will also be documented in the employment reference questionnaire form. Employment Reference Release Form – The purpose of this form variety is not only to record the contact information of the applicant’s reference person but also to document the applicant’s approval towards the employment verification and background checking process. There are four blocks allotted for the applicant’s reference information which will collect each reference person’s name, telephone numbers, email address, and company affiliation. Below the reference information blocks, the authorization and liability release agreement will be stated with the choice of the applicant of whether he will allow the employer to contact his previous companies and current manager or not. 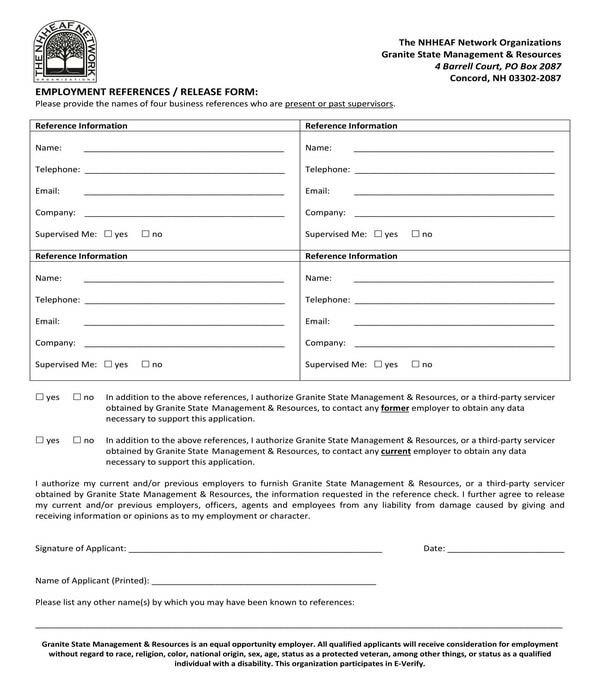 Summer Camp Staff Employment Reference Form – This form is suitable for companies and organizations whose main intent is to accept new employees and staff for a summer camp event. The form will not only state questions for the reference person of the applicant but also a satisfaction rating section wherein the reference person can place his score regarding the applicant’s qualities. Some of the items to be rated include the applicant’s ability to use positive reinforcement strategies to children, the applicant’s effective listening and communication skills, and the applicant’s attributes which shows that he can be a role model to any individual. In addition, the reference person must complete the signature authorization section of the form which is for certifying that his statements were based on his own knowledge and were honest employee appraisals about the applicant or the former employee. 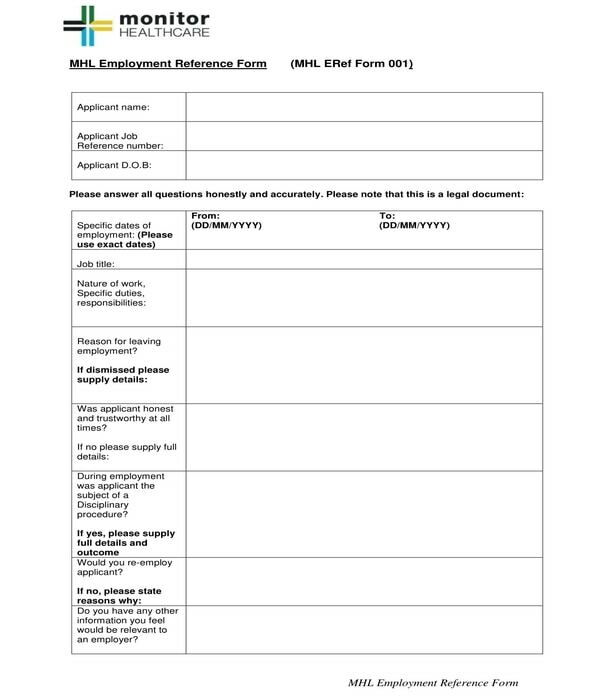 In closing, employment reference forms are important to be used by companies. This is due to the function of the form to provides ample documentation to the company about the statements, observations, and appraisals of an applicant’s reference person. The entries in the form can also be informed to the applicant in order to let him know that his disclosed references were contacted and that his employment records were verified for his job application.